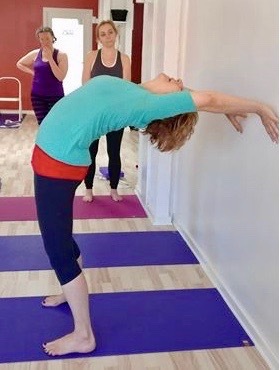 Workshop at Studie Yoga in Denmark. Props, and Drop-backs. 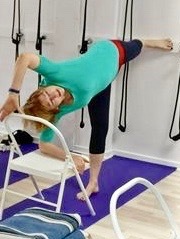 Ardha Chandrasana with Chair and Wall. Grip the standing leg buttock onto the pelvic bone and move the upper hip and elbow up and back. Curving back over an upturned chair. Revolve the upper arm skin in, toward the head. Observe, she is not gripping that slant-board – it’s resting lightly in her open palms. Dropping back to the wall. Move the tailbone in, raise the back ribs away from the lumbar spine and move the shoulder-blades down. You can walk down the wall, and also onto a chair. To come up, stamp down through the outer edges of the heels and feet and propell your back ribs forward and up. For those unable to raise the shoulders or press the shoulder-blades in, or who have compromised cervical discs, Sirsasana with two poles. 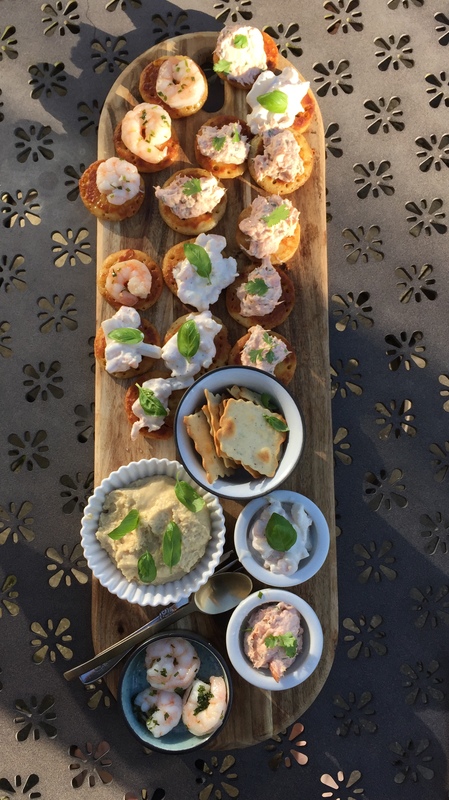 Delicious Danish hors deurvers. Mine, in the small bowls at the bottom of the picture, was gluten free.